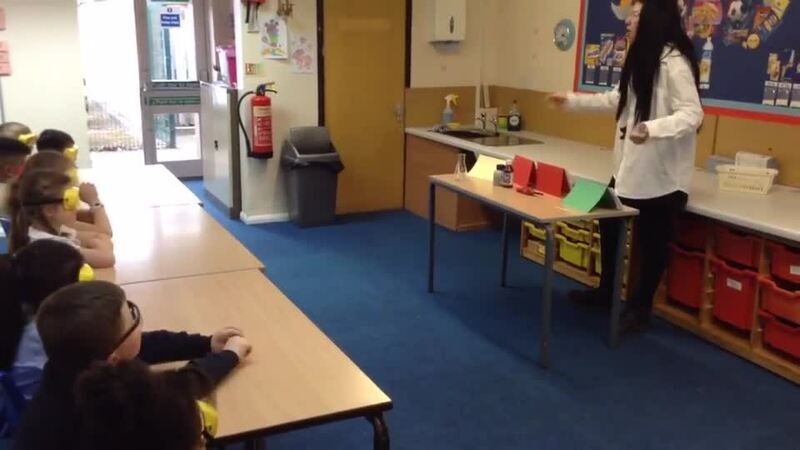 our teaching assistant is Mrs Asprey. Please see the half termly parent overview to find out what your child will be learning this half term, it is located in the curriculum tab. In Year 1, we have had so much fun learning about Dungeons and Dragons. To finish our topic, we have built our very own castles. 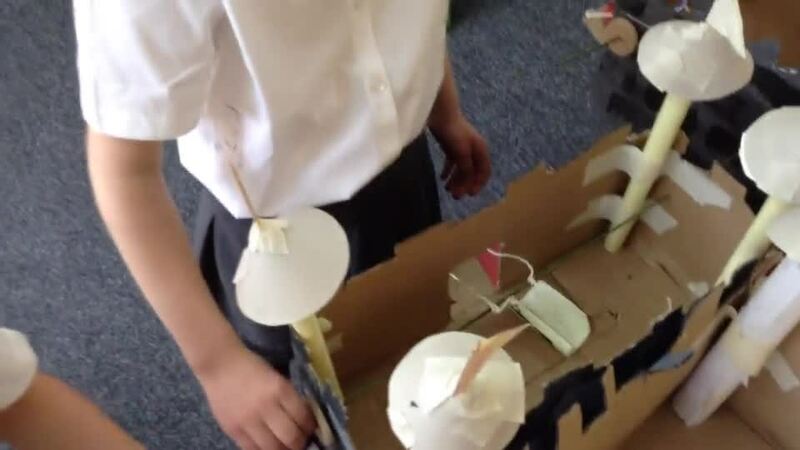 This week we added our finishing touches and created our own moving mechanisms to make a working drawbridge. Take a look at our video and be amazed! Do you believe in fire-breathing dragons? After delving deeper into the legendary dragon during Science Day, we thought about what we should investigate next. Year 1 decided that after looking at what dragons do have in common with reptiles, we should look at what dragons don’t have in common with reptiles. The difference that stood out to us the most was that dragons breathe fire. To our knowledge, no other reptile (or animal for that matter) possesses this skill. At this point, our class began to debate. They were fully aware that dragons are mythical creatures, but they had mixed views as to whether a dragon would have successfully been able to breathe fire. Therefore, we decided to investigate this further. We have had a very exciting visit from Warburtons' bakery. They taught us all about the history of their company and the importance of healthy eating. We then had the opportunity to taste some different types of bread. We tried wholemeal bread, white bread, fruit loaf and milk roll. The milk roll was our favourite. Then, we were able to bake our very own bread, we were so excited! We 'nipped and flipped' our dough into flour to stop it from sticking and we proceeded to knead it to remove any trapped air. After this, we shaped it into the body of a hedgehog, used scissors to create the spikes and added currents for the eyes. We had an amazing morning and we thank Warburtons for visiting us. As scientists, we are learning about reptiles. Today, we had a group discussion about what we think a reptile is and how we can identify them by their features. We found out that reptiles have scales, lays eggs (most of the time), are tetrapods (they have four limbs or, if they lack four limbs, their ancestors had four limbs) and are cold blooded. We then talked about some reptiles we know of with these characteristics, such as: crocodiles, snakes, turtles, alligators and lizards. In pairs, we were given a picture of an animal. We had one minute to decide with our partner whether we thought this animal was a living reptile, an extinct reptile, a mythical reptile or not a reptile at all. We then placed our picture under that heading. We all clearly experts at recognising a living, extinct or mythical reptile as we each placed our pictures in the correct area. After this, we wanted to look a little deeper into our legendary make-believe reptile, the dragon. We were asked, “what does a dragon have in common with all of these reptiles?” With sticky notes we wrote our answers. Take a look! 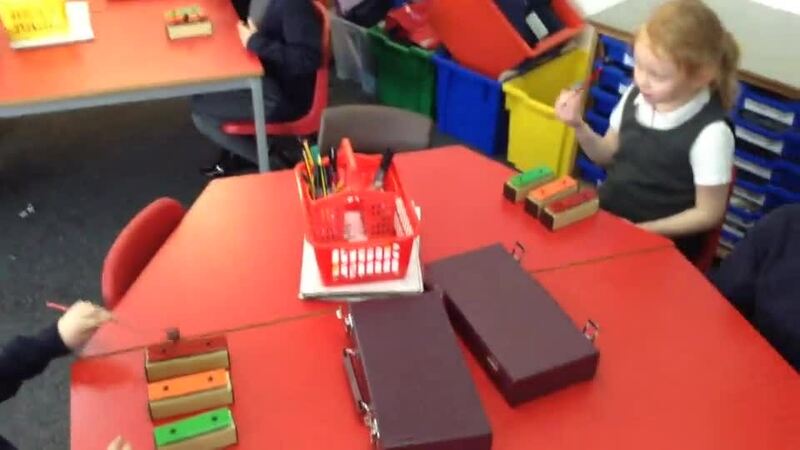 We have been learning all about pulse in our Music lessons. Over the last couple of weeks, we have listened to and appraised the Latin Bossa Nova style song, 'Round and Round'. After learning the lyrics and finding the pulse, we felt confident enough to add some music of our own. Today, we performed the song with the Glockenspiels. This is the first time we have used this instrument and Miss Butterfield is so proud of how well we performed, as it can be quite tricky to master. Take a look at us in action! Today, we came to school dressed as one of our favourite story characters and completed some exciting activities based around one of our favourite, classic stories... The Rainbow Fish. Collectively, we decided we would like to do some research about under water animals. To do this, we worked in pairs and used the internet to read up on some sea creatures and create an animal fact file. We described the animal of our choice, explained their diet and habitat and wrote an interesting fact, too! We also created some Rainbow Fish collages with tissue paper. Year 1 had an amazing time celebrating World Book Day. Mrs Asprey, Miss Learoyd and Mrs Skitt cooked us pancakes today and we tasted two different kinds. One batch had lemon and sugar on, the other batch had syrup on. Yummy! Our topic is Dungeons and Dragons. During the first week of our half term, we have been on an educational visit to the Royal Armouries. We got to meet Sir George and try on his armour as well as listen to his dragon slaying adventure story. After this, we worked with together with Year 2 to help Sir George rebuild his castle, which was destroyed by the fire-breathing dragon! Royal Armouries gave us a tour around their museum and we looked at interesting pieces of armour and weapons that were used by knights a long time ago. We also looked closely at how castles were structured to enable us to apply these features to our own structures in our D&T lesson, later this term. We thoroughly enjoyed our time at Royal Armouries and we thank them for providing us with new found knowledge and exciting experiences. This afternoon, Year 1 had a wonderful discussion about road safety. We talked about how the traffic light system works and how to use pedestrian crossings. We also discussed the importance of, 'Stop, Look, Listen, Think!' We have promised to make sure that we remain safe near roads of any kind as we understand how dangerous and unpredictable they may be. This term in Year 1 we will be taking part in weekly PE sessions with Wakefield Trinity members learning about the sport of rugby. Take a look at us in action! This term our topic is World Kitchen. We went on an educational visit to Pizza Express in Harrogate. We learnt lots of interesting facts about pizza toppings and where certain pizza ingredients come from. We were each then given the chance to make our own delicious pizza. We enjoyed eating our creations at lunch. The Christmas season is always lots of fun in school! Today, we have been full of joy and feeling excited about decorating our classroom tree. In respect of the 100 year anniversary of the vote for women, Year 1 discussed how it is important that we are all different but all equal. The children couldn’t believe that men and women have not always been equal, like we are today. In celebration of Vote 100, Year 1 iced suffragette biscuits and made posters to encourage equality. Our topic this half term is Fire! We have had the privilege of receiving a visit from the West Yorkshire Fire and Rescue Service. We got to watch the ladder on top of the fire engine reach up to 30 metres tall. We were able to sit inside the fire engine and try on the equipment, such as: oxygen masks, fire helmets and gloves. We learnt a lot from our special visitors and we thank them for coming to see us. We have had a super time dressing in our spottiest clothes to support children and families less fortunate than ourselves. This fundraising day has taught us all about Children in Need and what it represents. Thank you all for your generous donations. As part of Anti-Bullying week, KS1 and EYFS attended a special assembly to learn all about how we say no to bullying. Our topic this half term is About Us. To learn more about ourselves and how our bodies function we organised a trip and visited Eureka! We had so much fun exploring the many galleries Eureka! had to offer. Year 1 enjoyed the Gross Lab science show the most. During this workshop, we had the opportunity to explore the science behind all the icky, sticky and yucky stuff our bodies do and why it is important. We learnt what happens when we cut ourselves, which organs are involved in the digestion process and the jobs they do, and why we need to burp and poop! In indoor PE, we are doing gymnastics. We are learning how to create different shapes and levels using our bodies. Here we are perfecting our different star, tuck, dish and arch shapes.